The City of Maize, in coordination with the Wichita Area Metropolitan Planning Organization (WAMPO) and a Core Team of community members, is developing Maize in Motion. The effort will result in a master plan for safe pedestrian and bicycle travel in the city. The planning process for Maize in Motion began this summer and will continue through the fall of 2018. It will identify a future city-wide pedestrian and bicycle network, along with other improvements (parking, signage, and lighting). Maize in Motion will also suggest linkages to surrounding communities for regional connectivity. During the effort, the City, WAMPO, and Core Team will reach out to community members for feedback on issues, opportunities, recommendations, and priorities. The City will present the draft Maize in Motion plan to Planning Commission for approval and to City Council for adoption during fall 2018. City staff, elected officials, and community members may use the final plan to pursue funding for design and construction of recommended improvements. Maize in Motion is happening in coordination with the City’s current efforts to update the Maize Comprehensive Plan and develop the Academy Arts District Master Plan. We want to hear your ideas about how to make walking and bicycling in Maize safer, more comfortable, and more inviting for all residents. Comment on goals for safer walking and biking, the future walking and bicycling network, desired facility types, priorities, and funding options via the online opinion survey at www.surveymonkey.com/r/MaizeInMotion2 through October 12, 2018. Visit with staff to review our progress to date and provide input at the Celebrate Maize public open house on Wednesday, September 26 from 4:00-6:00pm. The meeting will be at the Community Building (401 S. Khedive) in City Park. No formal presentations will be given, so stop by anytime. 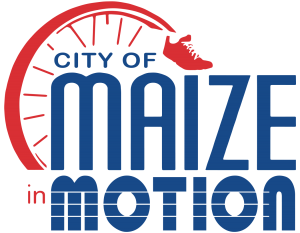 Staff from the City and Maize In Motion consultant team will be present to answer questions, explore ideas, and more.